Enjoy Technology is a US-based retail company that is changing the way people purchase and enjoy technology products. Credited with inventing the mobile retail store, Enjoy allows consumers to purchase a product through one of Enjoy’s product partners, such as an iPhone from AT&T, and have the product hand-delivered and set up by an Enjoy Expert. Enjoy provides their on-demand service at virtually any location, such as a coffee shop or the customer’s home. In order to maintain rapid growth across the United States and prepare for expansion in the United Kingdom, Enjoy needed to nearly double their workforce, growing from 700 to 1,300 employees. Enjoy realized they needed scalable, systematic recruitment processes to efficiently and successfully hire the technology experts their services depend on in multiple markets. Partnering with a workforce solutions company would ideally close the hard-to-fill gaps in their talent acquisition process and identify employees who will thrive in Enjoy’s inspiring culture. 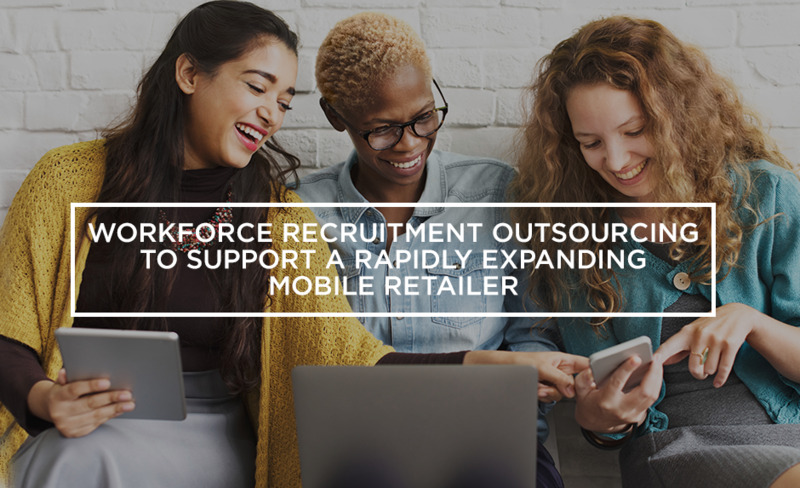 In deciding to outsource part of their recruitment function, Enjoy also hoped to accelerate high-volume recruitment while reallocating time and money to other mission-critical initiatives. Partnering with an experienced workforce solutions company who would serve as an extension of their vibrant company culture and support their growth became an immediate necessity. In 2018, we placed nearly 100 Enjoy employees in support of Enjoy’s growth. From Field Experts to Division Heads, we’ve successfully placed employees in over 33 cities across the United States and also in the United Kingdom. Our recruitment process outsourcing (RPO) solutions are driven by real-time reporting in order to make quick and accurate data-driven decisions. With visibility into Enjoy’s operations through accurate metrics and key performance indicators, we’re able to measure success while also providing a roadmap to effective hiring ramps and scaling efforts. For example, our reporting revealed that for every five candidates we engage for Enjoy, three will make it to the interview stage and one will receive and accept an offer. Those are extremely efficient hiring metrics that allow us to understand and strategize how to effectively approach a large-scale hiring event. We aren't just interested in how the data informs our hiring speed but also how it informs our effectiveness. In 2018, we maintained a retention rate of 88%. Compared to a retention rate of 60% by similar companies in similar industries, we’re confident that staying true to our company mission, providing people with opportunity and enrichment through work, makes the difference. Our mutual success with Enjoy has been driven by the synergies of our cultures and core values. Both of our organizations understand how culture and hard work are the strongest foundation for growth. At Eastridge, we believe in and embrace Enjoy's values: Kindness, Experience Obsessed, Growth Mindset and Winning Together. We apply our own core values (Commitment, Integrity, Creativity, Communication, and Deliver Our Best) to ensure we never lose sight of what guides our efforts. We also sincerely believe in Enjoy’s company mission and goals and understand how critical teamwork is in accomplishing them. For Enjoy and Eastridge, those qualities culminate a true partnership. Communication and inclusion have also played vital roles in our success. From day one, Brandon Wadley, Enjoy's Head of Recruitment, has been the ultimate partner. He understood how important it was to treat Eastridge as an extension of his internal team to ensure we intimately understood Enjoy's culture and challenges. With Enjoy’s collaboration, we have become a true extension of their organization. They have allowed us to sit in on internal meetings, provided access to their reporting and KPIs, and fostered a positive environment for constructive feedback. With fewer barriers between our organizations, we were able to create a stronger, results-oriented partnership. At Eastridge, we feel fortunate to partner with authentically passionate companies like Enjoy. We’re confident in their success and look forward to continuing our RPO support as Enjoy expands domestically and in the United Kingdom. If you’re interested in how our RPO programs can help your organization thrive like Enjoy, contact us today. Values & Culture - I said this a couple of times yesterday....if there was an Enjoy for recruiting, it would be Eastridge. The similarities between our two companies in what we care about, how we treat each other and how we approach work are uncanny. You all have built a great company founded on strong values and led by purpose-driven leaders. It's the same reasons why so many of you have been with Eastridge for so long. Congratulations… you are a part of something very special. Capabilities - you are very good at what you do. It's clear that you are experts in what you do and have systems, processes, and programs to scale and repeat. We can learn so much from you as we expand into new markets together. The image that's in my mind is an army behind us who is hungry, eager and trained to climb the summit with us. This gives me tremendous confidence in what we are about to undertake. Work ethic - like so many of us at Enjoy, you are hungry to win but you are competing with yourselves vs. your competition. Our CEO, Ron Johnson, reminds us often to get better every day and to adopt a growth mindset. I see that in each of you and how you approach your work. Like us, you are also obsessed with your customers. This was reflected in all the details you managed for our visit yesterday, thank you! Your heart - there are many companies who do what you do but very few have the hearts that you have. This matters. One of our values at Enjoy is kindness which, in my opinion, is our secret sauce. As Maya Angelou has shared, "...people will forget what you said, people will forget what you did but people will never forget how you made them feel." This is what we are trying to do every day at Enjoy as we bring the mobile retail stores to our customers. We want them to feel special and cared for. From everything I saw, you also adopt this same mindset. Thank you, team. You are amazing and I look forward to deepening our relationship with Eastridge in the years ahead.